Question: How to generate a scale for a phylogenetic tree? I have generated phylogenetic trees for a gene dataset by Neighbor joining and Maximum likelihood methods with 1000 boostrap replicates using PHYLIP v3.69 package. 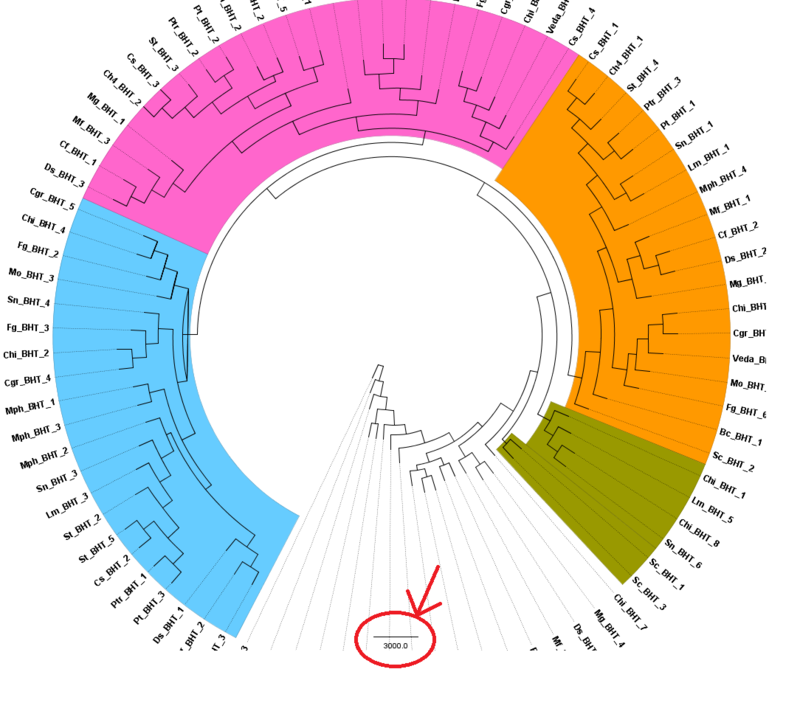 I observed in various research articles that the phylogentic trees also have a scale-bar (which mostly represents residue substitution per site). When I visualized the generated trees in FigTree v1.4.2, the scale bar unit (number) seems to be in thousands! While mostly the scale bar represents 0.1 or 0.5 such numbers. Moreover, I visualized the trees in MEGA v6, so as to find out whether FigTree possess any bug or not, but the option for statistics/scale cannot be used therein due to some unknown reasons. I intend to add a scale bar to my tree graphs, please advice me how to generate the optimal scale and value in accordance with the graphs. P.S: Please let me know if you want to know about the parameters used in NJ and ML methods, if they would help you in providing a solution. If you're familiar with R and ggplot2, then have a look of ggtree. There may be something wrong with your trees. I have never had an obvious problem with FigTree in terms of the scale bar, and I've been using it on a variety of trees for years from all sorts of different datasets. If MEGA can't display it it means it can't calculate it, since the scale bar is calculated based on the branch lengths of the tree you input, it isn't a separate piece of data that is put in the tree file. Please kindly take a look at this image generated by FigTree. I have generated this tree with 1000 bootstrap support using Seqboot-> Neighbor -> Consensus workflow of PHYLIP v3.69 with default parameters. The scale you see in this image has a value as 3000.0. But in many research articles which I have seen the scale is generally in single digits as in 0.1, 0.5, 1 or 2. So is this value a bug of FigTree or bootstrap dependent (I have seen variation in this value as against 500 bs & 1000 bs) OR should I scale down this value, if yes, what is the valid way to reduce the scale to a single digit number? Awaiting your reply. P.S: Also note a bug in FigTree, if you use 'Scale bar' option, then the image exported is cropped and not complete, as you can see in the tree image above. So have found a way to overcome this bug? Thanks again. As for the cropping issue FigTree has a variety of tools you can use to change the zoom level, etc of a tree you are viewing. If you reduce one or more of those you should be able to fit the whole tree in the viewable window. Not sure if it will effect what happens with export or not, its been awhile since I have had to use FigTree for anything other than some pretty simple trees as I don't work in phylogenetics directly anymore. As for diagnosing the tree, that is always tougher. The real question is what do your branch lengths look like? The scale bar is derived from the branch lengths, so the first step is to get an idea of whether there is a large mismatch between the branches and the scale bar. How to construct an species phylogenetic tree?